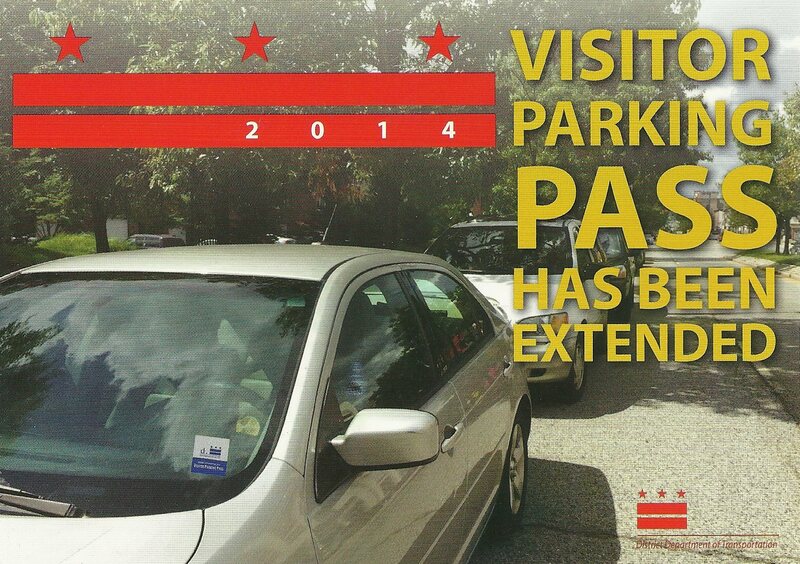 You Can Start Requesting Your 2015 Visitor Park Pass | Park View, D.C.
At the end of September, residents with visitor parking passes will have noticed that their 2014 passes expired at the end of the month, yet they hadn’t received their new passes. Like last year, DDOT has extended their use until December 31, 2014. But unlike last year, if you want a new visitor parking pass for 2015, you have to go to the DDOT Web site and request a 2015 pass. According to the DDOT Web site (http://vpp.ddot.dc.gov/vpp/) eligible residents can now start pre-registering for their 2015 passes. (Washington, DC) – The District Department of Transportation (DDOT) today announced the publication of proposed rules that will modify the annual Visitor Parking Pass (VPP) program, and clarify the process for eligible households to receive, and use a 2015 visitor parking pass. The rules are open for a 30-day comment period, and DDOT welcomes comments on the proposed regulations. The VPP program allows guests of District residents to park for more than two hours on residential blocks. The current 2014 passes, which would have expired on September 30, 2014, have been extended, and are valid until the end of the year. Starting January 1, 2015, DDOT proposes that the annual VPP be effective for a calendar year. These proposed rules will require eligible households (within Wards 1, 3, 4, 5, 6, 7, 8 and Advisory Neighborhood Commission (ANC) 2F) to register either online at http://vpp.ddot.dc.gov, or by phone at (202) 671-2700 to receive an annual VPP. The revision to the program will help DDOT better manage the demands, and evaluate program needs going forward. Depending on the outcome of the comment period, DDOT anticipates opening up registration in late October 2014. Additionally, the proposed rules clarify the privileges and restrictions of a VPP, that it provides temporary residential permit parking privileges to a vehicle, as long as that vehicle displays a valid pass on the driver’s side of the vehicle’s dashboard, and is used only within the ANC boundaries indicated on the pass. Written comments may be sent to Samuel D. Zimbabwe, Associate Director, District Department of Transportation, 55 M Street, S.E., 5th Floor, Washington, D.C. 20003. However, comments sent to DDOT’s Public Space Policy Office, are encouraged. This entry was posted on October 3, 2014 at 7:34 am and is filed under DDOT, parking. You can subscribe via RSS 2.0 feed to this post's comments. Kent, have they changed the eligible streets? It’s telling me I’m not eligible, though I have the 2014 one. Thanks. Not gonna lie… the new system just seems like a roundabout way to get our personal information, which I don’t think they should have. Why can’t they just mail them to us?